It seems like almost everyone is getting involved in group exercise today. On any given day in a warehouse, in a park or at the gym you can find people exercising together. There's everything from Running Clubs, Active X, and Roller Striders to Boot Camp classes. So why exactly are so many people jumping the 'lone wolf' ship to work out with others in a group setting? What is the big attraction? I've been involved in fitness for 25 years now and have belonged to power lifting and running clubs, but I've also been that solitary figure in the gym and on the road. I do feel this has given me a pretty good understanding of the appeal and the dynamics of both. 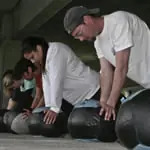 Years ago I started my own outdoor fitness company, Gut Check Fitness, which recently got voted "A-List Best Boot Camp" San Diego and Competitor Magazine, "Hardest Workout." This is where my passion lies. Whether you join a workout group or get your own group of friends together for a workout, here are three reasons more is merrier for earning your fitness gains. Unless you're that rare person that can jump out of bed at 5 a.m. and hit the ground running, odds are that getting and staying motivated are difficult for you. You are not alone. The majority of the people I've worked with over the years have had the same problem. That's one of the great things about the group setting. Many people who attend a class will show up exhausted from the ups and downs of everyday life. But once they join the group, they become re-energized. With a friendly fitness instructor there to light a fire under you rear, it can't get any better. Not only are you more motivated to get out of bed and exercise, but there's the motivation to improve your current fitness level. If you work out with people who are faster, stronger or fitter than you, you are probably going to get in better shape. There's an old saying that goes, "The lead dog sets the pace for the rest of the pack." Think about it. Remember when you were a high schooler and your mom would wake you up in the morning to go to school? She was holding you accountable. If you were anything like me, you probably wouldn't have graduated without her wake-up calls. Thanks Mom! A workout group can do the same thing for your exercise routine. I've had countless clients over the years at Gut Check Fitness say, "I wouldn't be there in the morning if I didn't know that Kim, Ron, Nancy, etc. were going to give me a hard time for not showing up." The fear of group teasing gets them out of bed. Hey, it works! Plus, there's the friendly instructor again that keeps track of your tardiness. I take a daily roll at my classes then each week I look to see who's been playing Harry Houdini. If I haven't seen someone for a week or two, I'll generally send them a friendly reminder with the threat of numerous burpees. This usually does the trick. Human beings are social creatures. Yes, a few are hermits and recluses, but the majority of us love to be around other people. We love to laugh, joke and have fun. I feel this is one of the greatest products of a group workout setting. Nothing brings people closer quite like misery and physical suffering. If you've ever done a boot camp or similar class, you'll understand what I'm talking about. Many people sign up to get more fit and along the way become friends through this mutual ritual. Many become lifelong best friends. My classes not only work hard together, but they play hard together. We regularly have happy hours, wine tastings, and sports days where we do races and events together. We sincerely enjoy one another's company. It's truly one of the best ways to meet people like you and develop a common bond while getting into the best shape possible. Joining a workout group can keep you motivated, hold you accountable and help you develop a sense of group camaraderie. Finally, in a world where we've become so dependent on email and texting, working out with a group offers that human interaction that is slowly disappearing. We can do just about everything today virtually without ever talking to a person. That is outside of a group fitness setting. With group fitness, you have to get involved. You can try to escape to the back of the pack, but a good instructor will integrate you into the group whether you like or not. That's why it's called group dynamics, and that's why technology will never replace the good 'ol fashioned group workout. Get out of your cubicle, your car or your house and go meet other people that have a common interest just like you. You never know, you might just meet some real friends instead of the ones you find online. Active Expert, Joe Decker isan ultra-endurance power athlete and renowned fitness trainer who hashelped thousands of people get into shape. He has completed many of theworld's toughest endurance events, including the Badwater 135, and theGrand Slam of UltraRunning. In 2000, Joe broke the Guinness WorldRecords? Twenty-four-hour Physical Fitness Challenge to help inspireand motivate people to get fit. He is recognized as "The World'sFittest Man." Visit his website at www.joe-decker.com .